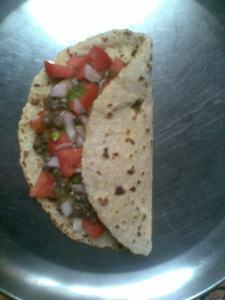 Kaali dal, roti, some tomato onion salad and a seasonal subzi is a typical punjabi lunch, especially in winter days. 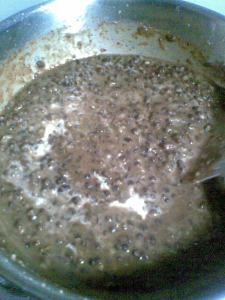 Kaali dal is actually black lentils and the spicy dal made with whole black lentils is called kaali daal itself. The kaali dal 'makhni' represents the way it is made, that is, with butter and hence the name makhni as makkhan is butter in Hindi and Punjabi. 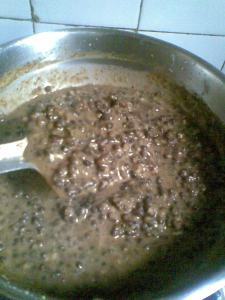 There is another version called daal makhni which is made using a mix of different kinds of whole and split lentils and that is different from this recipe. 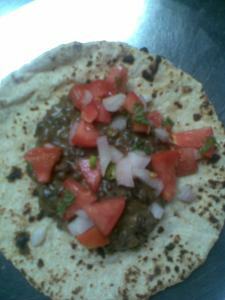 Brad from naughty tastebud had posted a tortilla and blackbean pie some time back and since I like black beans in any form I was curious as there were a few north Indian elements in this recipe reminding me of kaali daal makhni. I promised him that I will share the recipe. This daal is a traditional Punjabi recipe and you can get it at many highway dhabas (rustic budget eateries) topped with lots of butter. Also in the traditional cooking method the daal is cooked on a very low heat (in a wood fired oven) for almost 6-8 hours or overnight. (final step of spice tempering) in kaali dal. Slow cooking gives this daal a different and earthy flavor. In a modern kitchen slow cooking is not possible, so the cooking is done in phases. In the first step, when you soak the lentils, give them a gentle boil and leave it for 3-4 hours, then add the salt and a boil again lightly and let it rest on the gas stove itself, after it comes to room temperature again it can be cooked till done on low flame. black pepper corns 20 nos. 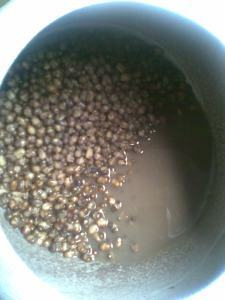 As we make it for a lunch, I just soaked and boiled the lentils once when I got up in the morning. Add 3 cups of water to the lentils in a pressure cooker pan and give it gentle boil or simmer and put the flame off. Let it rest on the gas stove itself so that it is warm till longer time. After may be 3 hrs I boiled it again adding salt this time and put off the flame again for a while, though you can proceed the cooking this time too. I started cooking after an hour or so as this way the lentils disintegrate partially. Now throw in the tejpatta, ginger garlic paste, red chilly powder and simmer on low heat till the lentils get mushy. It takes about an hour and half when cooked without the lid so I quickened the process by covering the pressure cooker with whistle on, but cooked it on low heat. This way less pressure is built and there is no whistle while cooking, needs to be cooked for 20 minutes or till the daal gets mushy but doesn't disintegrate. Open the cooker n transfer the daal to a wide pan like kadhai, and add the powdered masalas and cook covered on low flame for 15 minutes, add the amchoor powder and keep stirring in between and mashing the daal with the spatula. Finish with grated nutmeg, cream and some crushed kasoori methi if you like. Mix well and it's ready to serve. Usually it is served with a dollop of butter but I have skipped it. Please do add butter if you like. Alternatively, the daal can be cooked in one single step. Pressure cook everything togethe, except the finishing masala and then proceed to finish and enjoy. There is a slight difference but the quick version is delicious too, if not authentic. I make it mostly the quick way but wanted to give this semi authentic version for you. Most authentic version of kaali dal will be wood fire cooked and smoky in taste. The smoke can be recreated by placing a burning piece of coal in the dal for some time but the original is a different level. I served it with roti, tomato salsa, and a potato and lobiya stir fry (stir fried with just salt, turmeric powder and garlic and green chilly paste). 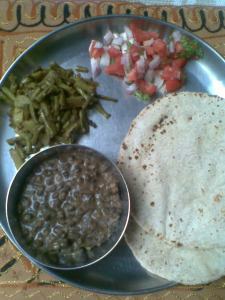 Kaal dal can be directly spread on roti along with salad and rolled up to eat. This is soul food. And now a quick tutorial on making the roti. I like the roto to be a little thicker with kaali daal. 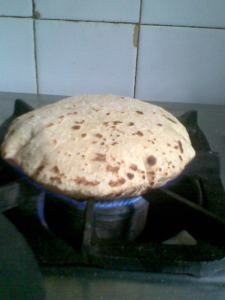 The thinner version of a roti can be called a phulka or chapati, it's the same anyway. You just need whole wheat flour and make a dough by adding just enough water and kneading with your fingers or use a food processor. I have mixed a little soy paste so the edges of the rotis are not very smooth, with just the whole wheat flour it's smooth. You have to take a ping pong ball sized portion of the dough and make a smooth ball of it. 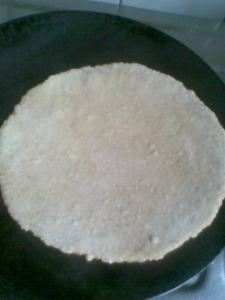 Roll it with a rolling pin on a floured surface, lift on your palm and spread it gently over a hot tawa or griddle. Wait till the color of the roti changes a bit and small bubbles appear like the picture, then flip over the roti, in the mean time we can roll the next roti, you can actually learn it with a little practice. 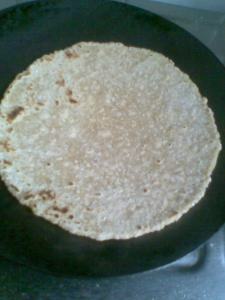 Now wait till the roti gets brown specks on the other side, takes about 30 secs. Pull the tawa or griddle away from flame and with the help of tongs, hold the roti and place it over the gas flame, take care to keep the less specked side down, it will fluff up like this. Remove from flame and keep covered inside the folds of a cloth napkin to keep it soft, serve hot or warm. Hope the roti tutorial is helpful. Keep them coming dearie, u r doing a great job! Hi Sangeeta kaisi ho? 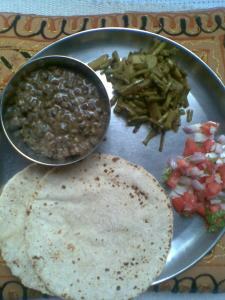 Your dal is very nicely explained and the dal and chapati rolled together look yummy. Even I am missing the good old Dhaniya in my khana.I am waiting that it rains endlessly for a few days. Do u follow twitter? Dal makhni looks lovely and yummy. Roasting the spices in microwave thats very good idea. Liked the pic of your fluffed roti on stove. I'm very excited to try this, thank you Sangeeta! I love how you always grind and roast your spices just before you use them. I recently read a book about the history of Indian cuisine, called Curry by Lizzie Collingham... she stresses the importance to Indian cooks of not only freshly grining and roasting spices, but of adding them to the dish at very specific points during the cooking process. thanks all of you for your generous comments. thanks Brad . you can find more curries n authentic Indian food here.